I’m pleased to announce that the latest release of Prism is available for you to preview. This includes the ‘More Like This’ service, classification marks in advanced search and some performance tweaks to searches and the ‘All Lists’ page. These features are now available for you to preview and we urge you to make the most of this period to gain familiarity with the new features and ensure that your tenancy still behaves as expected. As usual, you can preview this release by inserting ‘/demo/’ after the prism.talis.com part of your URL and before the name of your tenancy, e.g. prism.talis.com/demo/mytenancy/. If you have your own host name, you’ll need to use prism.talis.com instead. 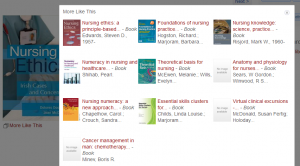 ‘More Like This’ suggests similar items when a borrower is vie wing an item details page. We’ve provided two ways to view the suggestions, a widget at the bottom of the page showing a sliding window of 3 items at a time and a ‘lightbox’, accessible from the left hand menu, that pops up and shows all suggestions. The mobile interface also has a suitably optimised sliding window widget tailored to the needs of smaller screens. If you’ve enabled the ratings feature in Prism you’ll notice that, as well as a cover image, title, author and format, we also include the average star rating for the items being suggested. As discussed in the webinars we’ve partitioned the loan data that powers this service into two pots – one for our academic customers and one for our public customers. The data itself is keyed on standard identifiers such as ISBN, EAN, ISMN and UPC and then intersected with your local holdings so that we only show suggestions that are available in your catalogue. We use the loan data you’ve provided to find items that were borrowed by the same person and use this to build up a list of suggestions; these are ranked in order of similarity to the item being viewed. If you’ve not had ‘More Like This’ enabled on your tenancy yet you can get a taste of what’s to come by viewing some items in our demonstration tenancy http://prism.talis.com/demo/birmingham/. More Like This is switched off by default and is enabled on request at no charge when you contribute your loan data. We ensure that this has no impact on your operations, and no personal borrower information is shared. The process of copying the data will not require any work from you, or any downtime and all contributed loan history is completely anonymous. We’ve already had over 50% of our customers agree to include their data, so if you would like to but have not done so yet, please confirm that you are happy for us to use the loan data for recommendations for your institution by emailing libraries-sales@capita.co.uk and we will raise a case for you. 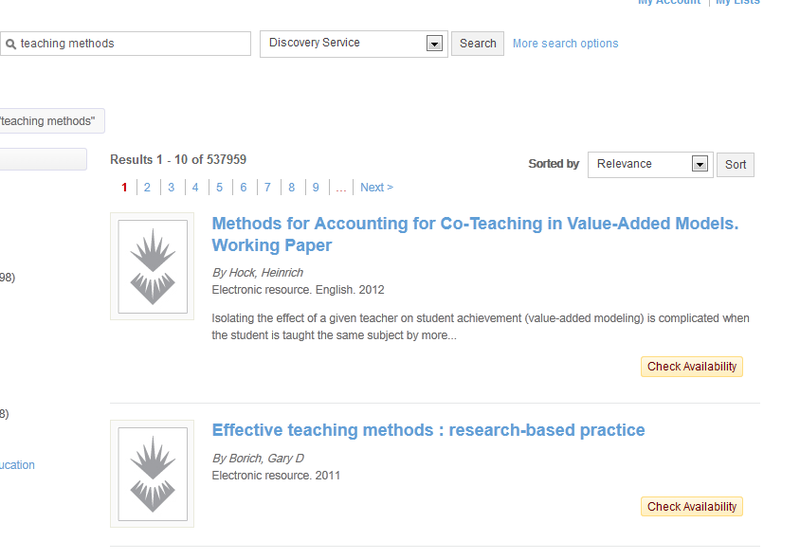 This release also brings an additional option to the More Search Options page, labelled Classification Mark. 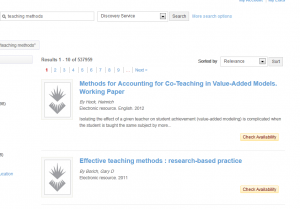 It provides an explicit way to search by classification number, which has been available since the May 2011 release as an expert search with the qualifier ‘class:’. It searches classifications from your local Work classifications, both main and other, so it covers most or all of the classifications used in your item shelfmarks. Useful tips for searching for a classification number, as well as other types of search, can be found in the Expert Search Options documentation in the Prism forum. This version of Prism will be released to the live service on 15th January 2013. If you have any comments, questions or suggestions please get in touch. You can comment here on the blog, on the Prism forum and Prism Ideas or contact your Account Manager or the Prism team directly. To keep up to date with the latest Prism Developments you can register for the free webinar on Monday 19th November 2012 at 12:00 for Public Libraries and 14:00 for Academic Libraries. In the meantime keep up with the latest Prism news and developments on the Prism website and here on the Prism blog. I’m pleased to announce that the recent preview release of Prism has now been deployed to the live service. For full details on the inclusions please visit the preview release notice. The list sharing feature is switched off by default so you will need to go into the Admin Console to switch it on and configure your content moderation options. It is strongly recommended that you try this in your sandbox tenancy first. If you have any comments, questions or suggestions please get in touch. You can comment here on this blog, on the Prism Forum or Prism Ideas or contact your Account Manager or the Prism team directly. I’m pleased to announce that a new version of Prism is now available for you to preview, and that a new release of the Admin Console is now live. The highlight of this release is the ability to share lists. A currently popular feature with users is the ability to save items to lists for their personal use. 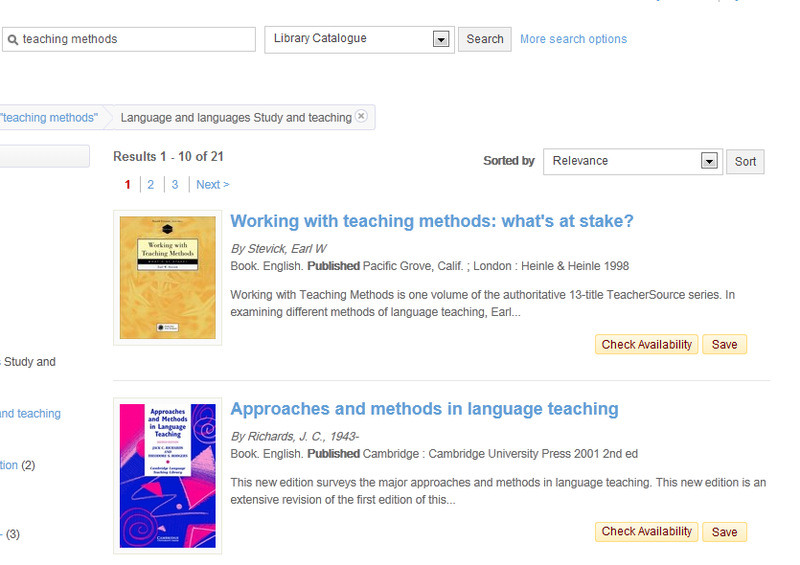 Now, subject to library control, a user can choose to make a list discoverable by other people who use the same library catalogue. The list owner, when signed in, can also now add tags and a description to a list, and these are included in the display when the list is shared. The list owner can also change the list title. It is now possible to re-order items on a list by moving them up or down and there is also a link to check the availability of an item, matching the one in search results. A user can discover shared lists by selecting My Lists; within the Lists area there is now an option to view ‘Everybody’s lists’, which displays a list of shared lists in descending order of creation date. A user does not need to be signed in to do this. Selecting a tag on any list does a search retrieving those lists with that tag. A user can also select a tag in one of their own lists to view all shared lists with that tag. 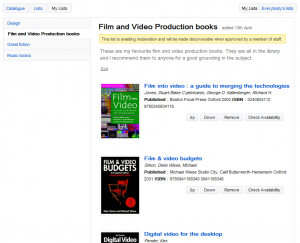 Selecting a list displays the items on the list as well as the list description and tags. When a user wants to see their own saved lists but they are not yet signed in, there is now a link in the My Lists area to ‘Login to access previously saved lists’; after logging in the user is shown their lists rather than being taken to the My Account area. 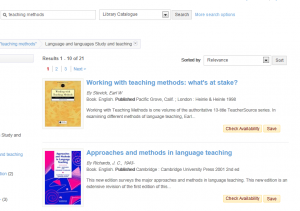 Lists are not aggregated for display in other catalogues because a list may contain items that are not held in another catalogue. The new version of the Admin Console, now live, has some additional features to support list sharing and to enable library staff to moderate shared content (list titles, descriptions and tags). you can set an email address to receive notification of additions to the moderation queue. There is a new area, ‘Content Moderation’ where library staff can review shared content in three categories: Awaiting Moderation, Already Blocked, and Live. Staff can review the content and block or approve it. Content is listed in descending order of date created. An entry can be expanded to review the full user-contributed content and the user barcode is shown. A count is shown for the number of times an item has been flagged as inappropriate. You can click to move the item into either of the other two categories. The format ‘Reproduction’ has been demoted in the preference order for selecting the single format to display in a results page entry. 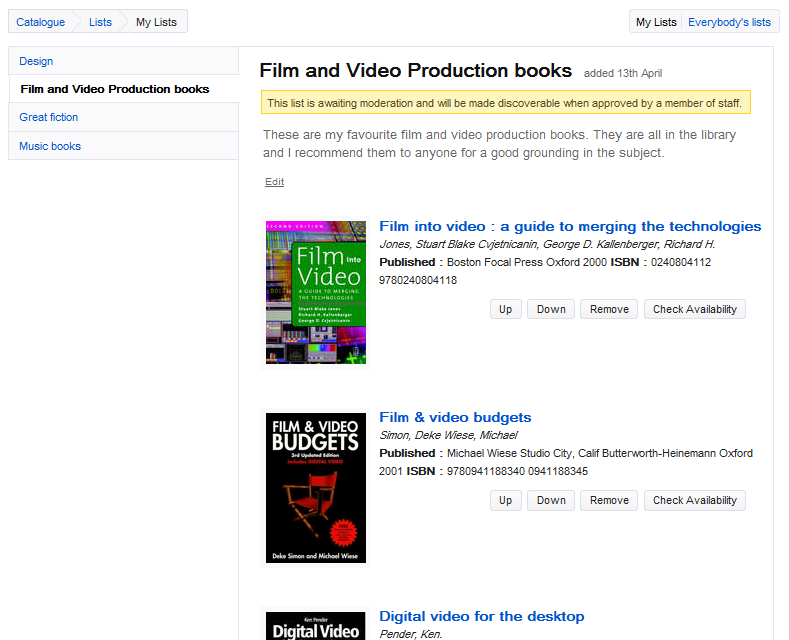 This means that those items that have both formats ‘Book’ and ‘Reproduction’ will now display as ‘Book’. The format ‘Thesis’ now has an entry in the format precedence list so it will now display in results entries. We’re planning on releasing these changes to the live service within the next week. We would appreciate it if you could try these features on your tenancy as we’d love to get feedback on them and you will want to ensure that there are no problems with your local styling. The new features are switched off by default so you will need to go into the Admin Console to switch them on. It is strongly recommended that you do this in your sandbox tenancy first, so that your users do not get the features before you’re ready when we put the Prism release live. As usual, you can preview this release by inserting ‘/demo/’ after the prism.talis.com part of your URL and before the name of your tenancy, e.g. http://prism.talis.com/demo/mytenancy/. If you have your own host name, to see the preview you must use prism.talis.com/ instead. The preview enables you to search your live data and access your live Local Data Services (e.g. for availability, renewals and reservations) using the new version of Prism. You can also use it with your sandbox tenancy. If you have any comments, questions or suggestions please get in touch; you can comment here on this blog, on the Prism forum and Prism Ideas or contact your account manager or the Prism team directly. To keep up to date with the latest Prism Developments you can register for the free webinar on Monday 26th March 2012 at 12:30 for Public Libraries and 14:00 for Academic Libraries.